The NDDC held its annual meeting at the Grand Event Center last night. Featured speaker: Jay Walljasper, Senior Fellow at Project for Public Spaces (PPS). 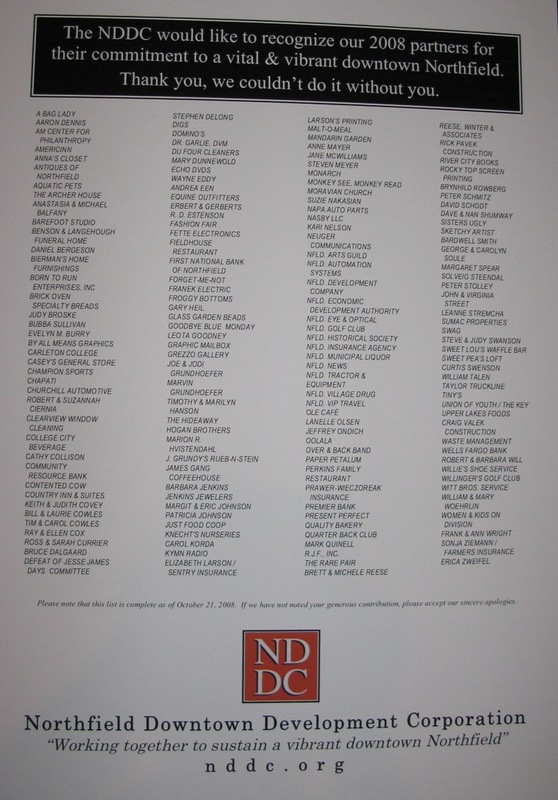 The photo on the right: a list of NDDC’s ‘partners’ for 2008. Click to enlarge. And a personal tip-of-the-blogger hat to NDDC board member Anastasia Belfany for featuring some of my downtown-related photos at the event. Great event last night at the Grand. kudos to the NDDC. Walljasper’s talk was full of great ideas for Northfield. Pingback: Northfield Downtown Development Corporation » Weblog » Preachin’ to the Choir? The downtown “candid” shots are so wonderful and really add to the vibe of what the NDDC is all about. A splendid event and I hope we all rally together to explore some of the ideas outlined by Walljasper. Northfield is such a delightful community but we need to actively work to make it such — it’s the responsibility of every citizen to support and sustain all that makes our beloved town so special. I am proud to partner with the NDDC in support of its mission.